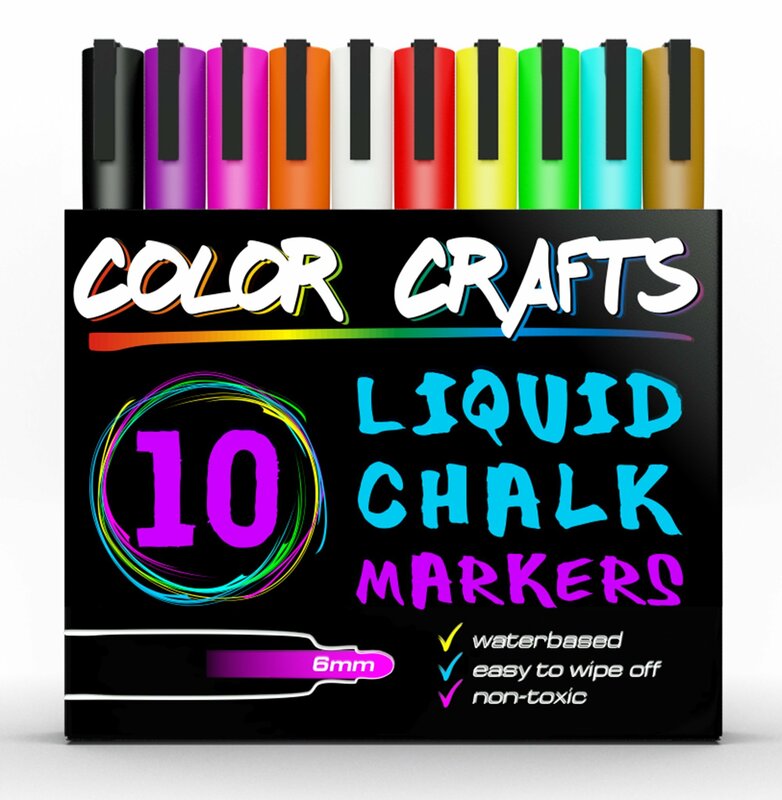 Home › Amazing Liquid Chalk Markers - Genuine Artist Quality - Ultimate 10 Color Mar..
Amazing Liquid Chalk Markers - Genuine Artist Quality - Ultimate 10 Color Mar.. BOLD & VIBRANT COLORS - Our premium quality concentrations result in incredibly bold, vibrant, & bright neon colors. You've never seen colors pop like this before! Huge Capacity: These are the Longest Lasting markers ever made! LET CREATIVITY FLOW - Both kids and adults can let their creativity flow. You'll be able to create incredible, eye-catching designs with bright neon colors using these fantastic chalk pens! Quick Drying. No Dust + No Smudging. UNIQUE REVERSIBLE TIP - Switch between bold and fine work with our unique reversible tip. Let the fun begin and start designing for Christmas, Halloween, Birthdays, and more! Also works great for drawing on menu boards for restaurants, bistros, and bars. ENDLESS POSSIBILITIES - The possibilities are truly endless. Perfect for tile, glass, windows, chalkboard stickers, plastic, metal, cards, chalkboard contact paper, whiteboards, and any non-porous surface. Unbelievable drawing quality! Fill with vibrant ink and fine & bold lines. VERY EASY TO USE - Super easy to use for both kids and adults. Even better, cleanup is instant and easy! Start drawing without worrying about cleanup time. Easily wipes away, no mess, no cleanup! Non-toxic. Odorless. No dust, fumes, or harsh chemicals. Super safe. Are you tired of dusty, mess causing chalk? Try our fancy dustless liquidchalk markers neon, that can be used to have fun on the sidewalk or even towrite thanks on your blackboard. Creative children love coloring with chalkoutside or indoors, and with this liquid marker you wouldn't have to worryabout your children becoming all messy with chalk all over their skin, itswashable and nontoxic. Now you can watch your children's creativity grow with these liquid chalkmarkers fine tip that are much more vivid than regular chalk. These markersare so mess-free that you can allow your children to play with chalk in thekitchen! Their drawings will be erasable on any surface of your house whenpainted on. They're easy to erase and you can even write on all types ofglasses! These are the most perfect dust-free liquid chalk markers 10 pack you'll findon the market, great for making decorations for the holidays or when you wantto get decorative with the liquid marker chalkboard. Just like regular markersbut better, easy to read labels with assorted colors and packs to choose from.The list of uses for liquid chalk markers is truly endless: chalkboards,blackboards, restaurant glass windows & boards, wallpaper, dry erase boards,board sign, mirrors, door, tiles, and your kitchen. Do you like to make your own type of arts and craft decoration on yourfavorite holiday such as colored chisels with bright neon colors? Do youprefer the fluorescent look? The sets in each 10ct 10-color pack you find arebeyond amazing, it packs vivid color, the decoration on the label speak foritself. The liquid chalk pens filled inside of the marker don't leak easily. And whenerased there isn't a chalky residue left, either. Decorative Artists, moms,teachers, and most schools love these markers. The reversible chisel tip onevery liquid marker pen will help you sketch, create paints, & list - allwithout the chalkier mess.